The introduction to this interview has been abridged. To discuss Egypt's prospects under the Abdel Fattah al-Sisi government, we invited back Dr. Raymond Stock whom we had interviewed in November 2012. (See: No Blinders About Egypt Under Muslim Brotherhood ). Stock is a Shillman/Ginsburg Writing Fellow at the Middle East Forum and a former Assistant Professor of Arabic and Middle East Studies at Drew University. He spent twenty years in Egypt and was deported by the Mubarak regime in 2010. He is writing a biography of 1988 Egyptian Nobel laureate in literature Naguib Mahfouz (1911-2006) for Farrar, Straus and Giroux and is a prolific translator of his works. Jerry Gordon: Ray Stock thank you for consenting to this interview. Raymond Stock: Thank you for inviting me back. Jerry Gordon: Egyptian President al-Sisi started 2015 with two dramatic moves- his New Year's speech at al-Azhar University and Christmas greetings at a Coptic church with Pope Tawadros II present. What were the messages he conveyed to Muslim clerics, Coptic Christians and the world? Raymond Stock: At al-Azhar, President al-Sisi was saying it is not merely an extremist interpretation of Islam that is threatening the world with global jihad, but ideas that are at the core of the mainstream, orthodox understanding of the religion--and that this would require a "religious revolution" to change. "[Al-Sisi] was saying that Islam as it is being taught and practiced by its leading religious scholars has given birth to a globally destructive ideology which is now threatening us all." At the Coptic Cathedral, he urged Egyptians not to define themselves by their religion, be it Christian or Muslim, but by the fact that they are Egyptians--a rejection of Islamism, which defines national identity in purely religious terms. To the world, he was saying that Islam as it is being taught and practiced by its leading religious scholars has given birth to a globally destructive ideology which is now threatening us all. Moreover, he wants to launch a movement within Islam to save the religion from itself, that is, before it tears itself apart completely and the rest of the world destroys it in self-defense. "And he challenged the clerics to take the lead in that effort by openly re-examining their own teachings and source materials for interpreting Islam." And he challenged the clerics to take the lead in that effort by openly re-examining their own teachings and source materials for interpreting Islam. Gordon: Al-Sisi has cracked down on press freedoms in Egypt and brought to trial three Al Jazeera correspondents. What in your view prompted that? Stock: Though no libertarian, it is hard to say if al-Sisi himself has had anything to do directly with the suppression of press freedom, though it is happening on his watch. Going back to Pharaonic times, Egypt's state institutions, the oldest in the world, and its political culture, have little tradition of respecting civil liberties. Some periods have been worse than others--the worst was actually under Gamal Abdel-Nasser in the 1950s and '60s, when many thousands of political prisoners were sent "behind the sun" to camps in the Western Desert. Al-Sisi is still so popular, the public so widely disgusted with the unending social and political chaos since the 2011 revolution, and so alarmed by the terrorist insurgency waged by the Islamists, that probably a majority of news editors and perhaps also of reporters have decided to support him completely and to oppose his critics automatically. At this point it is hard to find any clear connection with al-Sisi himself to this consensus, enshrined in a declaration by several hundred key media figures a few months ago. However, certainly if he didn't like it he could well speak up against it--yet he hasn't so far. Pro-Sisi demonstrators celebrate the third anniversary of Mubarak's overthrow, January 2014. Last summer he publicly regretted the imprisonment of the three Al Jazeera journalists, saying he wished they had been deported instead. Citing his belief in an independent judiciary, he refused to intervene in the legal process. Now that they are being retried after winning on appeal, we'll see if he pardons and deports them should they be convicted again. Gordon: Following, al-Sisi's ouster of President Morsi and crackdown on Muslim Brotherhood leaders, what has happened to the movement in Egypt? Stock: Though deservedly banned as a terrorist group, its top leaders in jail and the rest driven underground or abroad, it is far from dead and remains a threat to the Egyptian state and society. Its refusal to accept the June 30 popular revolution (far larger than the one that overthrew Mubarak), parental bonds to Hamas, financial support from Qatar and wealthy Gulf donors (and possibly Iran), partnership with the Salafis and ideological affinity and outreach to groups like al-Qa'ida and Islamic Jihad have served it well in retaining its base while gaining sympathy--especially internationally. "[The Egyptian Muslim Brotherhood] is far from dead and remains a threat to the Egyptian state and society." Though all these factors--plus its horrendous behavior in power--have greatly alienated the majority of Egyptians, they are for the most part also its greatest assets for the future, if they can only survive the current storm. As they have shown in several major periods of repression in the past--the most severe being under Abdel-Nasser--they only need to endure until there is successor to al-Sisi, who may decide to restore the MB to political legitimacy as a means of fighting al-Sisi's remaining political allies. (Anwar al-Sadat, for example, freed the MB activists from prison to combat the surviving members of Abdel-Nasser's coterie.) Such a situation could put them in striking distance of taking power again. Meanwhile, the MB has global headquarters in Istanbul and London, is very influential in Europe, and has enormously increased its penetration at the federal, state and local levels all over the US. As part of this, it has deeply bonded with the highest levels of the Obama administration, which uncritically backed its creation of an elected, one-party dictatorship under Morsi. Obama evidently seeks to help the MB to return to power in Egypt—as shown, for example, by the State Department's recent hosting of a conference of MB allies at Foggy Bottom, though it may take a while. Al-Sisi probably only has a year or two to turn the economy around before he risks another uprising. "[The Muslim Brotherhood] has deeply bonded with the highest levels of the Obama administration, which uncritically backed its creation of an elected, one-party dictatorship under Morsi." 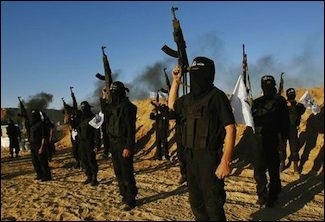 The goal of the terrorist insurgency is to discourage foreign investment and stifle the stimulus provided by major government projects such as the new second channel to the Suez Canal to aid the recovery from the last four years of chaos. This, they hope, will pave the way for new popular upheaval which they hope to manipulate if not lead. Gordon: Has the Islamic State supplanted the Salafist and Muslim Brotherhood movements? Stock: In a sense, yes, but the situation is actually quite complex. Ideologically, IS—like al-Qa'ida--is an extension of the Salafist movement and the MB (itself established as a Salafi organization in the Salafi library in Ismailiya, Egypt in 1928). IS, because of its uncompromising Islamist purity, harshness, brutality and its dramatic seizure of so much territory in Iraq and Syria, coupled with its incredibly savvy use of social media, has largely eclipsed all of its predecessors in recruitment of fighters to the Middle East. It also outpaced all of them in its creation of lone wolves and sleeper cells in Europe, America and elsewhere. Ansar Bayt al-Maqdis pledged allegiance to the Islamic State (IS) group last year. That includes Egypt, where the MB-and-AQ aligned Ansar Bayt al-Maqdis (ABM) organization is responsible for most of the attacks in the country over the past two years. ABM, along with its allies controls much of North Sinai and has declared its allegiance to IS. The MB, as noted, still retains a very strong base, as does the Salafi al-Nour Party which has pragmatically allied itself with Al-Sisi. The appeal of IS may frustrate their ability to draw younger members--yet it is far from clear that IS will do any better in the long run. So have many of the Islamists in Libya, the eastern half of which IS now controls, and may soon run Tripoli as well. The stunning success of IS provides further inspiration to groups like Boko Haram, which has overrun much of northeastern Nigeria and has recently spread into Cameroon, as well as al-Shabaab in Somalia. IS also now has a presence in southern Afghanistan and beyond. Unless it is destroyed militarily in the very near future--which is virtually impossible so long as Obama is President--IS threatens every state with a significant Muslim population, as well as the West, which is its ultimate target. Gordon: Al-Sisi has propounded a doctrine of stability for Egypt. What is it and has he succeeded since his election? An independent foreign policy—one that still seeks to maintain the traditional alliance with the U.S. and the West, but is not afraid to go elsewhere as needed. "Obama's backing of the Islamists and his cutting of aid for the past two years have driven al-Sisi to radically diversity Egypt's sources of funding and investment from abroad, including for the first time military aid." Obama's backing of the Islamists and his cutting of aid for the past two years have driven al-Sisi to radically diversity Egypt's sources of funding and investment from abroad, including for the first time military aid. For more than three decades, Egypt's military assistance came almost exclusively from Washington, though that is now being surpassed by multi-billion dollar arms deals from Moscow and even to an extent from Beijing, funded by al-Sisi's backers in the Gulf. That puts the Egyptian-American alliance and its principal benefits—the more than thirty-five year peace with Israel, our priority access to the Suez Canal (now being expanded with a second channel but without US investment), and vital cooperation on security issues—seriously at risk. Gordon: Some analysts have said that in the wake of the Arab Spring the old order of regional autocracies has re-emerged in an alliance against the Muslim Brotherhood. What is your view and especially in the case of Egypt's North African neighborhood? Stock: That depends on the country: in North Africa, King Mohammed VI is still in power, but the Muslim Brotherhood has won more seats than the other parties in parliament, a situation echoing that in Jordan, though it is less precarious at present. Algeria, still recovering from the savage Islamist bloodbath after the Army's annulment of elections in January 1992, was least affected of all the states in the region by the Arab Spring. (Perhaps the only major result there was the lifting of the State of Emergency that had prevailed for nearly two decades, in February 2011.) Tunisia, where the Arab Spring began in December 2010, threw out its MB-affiliate controlled government in a popular movement backed by the army—in a situation that rather echoed the one in Egypt, and late last year elected a new secularist plurality in parliament and a new secularist president, Béji Caїd Essebsi. In Libya, the feeble central government that we helped install by foolishly removing the vicious, eccentric but cooperative Col. Mu'ammar al-Qaddafi has predictably collapsed. Yet a new secularist-dominated government was elected last June 25 and a pro-secularist remnant of the Qaddafi era, General Khalifa Haftar, for the past year has been at war with the Islamist militias that have been the real powers since 2011. Haftar also wants to destroy the Libyan iteration of the Muslim Brotherhood, root and branch, especially after it launched an armed uprising in eastern Libya following Morsi's ouster in Egypt in 2013. As a result of this chaos, generated by our own needless—or at least, badly botched--intervention in the Arab Spring, the U.S. now has no effective presence in Libya. The security vacuum prompted Egypt and the United Arab Emirates to cooperate in launching air strikes near Tripoli last summer in support of Haftar's forces. IS and other Islamist organizations are now infiltrating weapons and fighters into Egypt from Libya, threatening the country's—and the region's—stability. In the Eastern Arab world, Egypt's principal allies now are Saudi Arabia and the UAE, who together immediately pledged 12 billion dollars in aid after Morsi's removal, and have given billions more since. All of it and more is desperately needed to compensate for the depletion of Egypt's hard currency reserves, loss of foreign investment and near-destruction of the once lucrative tourist industry that have all continued since the January 25th Revolution against Hosni Mubarak. Both the Saudis and the Emiratis oppose the MB and Hamas, who—along with Egypt under Morsi—are clients of their Gulf rival, Qatar. America's annual, mainly military package of $1.5 billion seems trifling in comparison (unless viewed cumulatively since it began in 1979). Still, it will be difficult to switch to mainly Russian or Chinese systems--much as the latter may be based on hacked American designs--after so many years of absorbing Yankee equipment and training. Gordon: What is the emerging change in Egypt's relations with Israel, both geo-political and economic? Stock: Unlike Morsi and the MB, who worked covertly with the terrorists in Sinai, al-Sisi wholeheartedly supports the peace with Israel. He has greatly increased security cooperation with the Jewish state—which had been endangered in the 2011-12 transition and during the Morsi era—to levels exceeding those under Mubarak. Again, even more than Mubarak, who loathed them too, al-Sisi sees the MB, Hamas and their Islamist allies as threats to Egypt as well as Israel. Likewise, he sees Iran—with whom Morsi sought a rapprochement—as Egypt's greatest strategic adversary in the region. "Unlike Morsi and the MB, who worked covertly with the terrorists in Sinai, al-Sisi wholeheartedly supports the peace with Israel." As a result, Egypt is now in an informal alliance with Israel, the United Arab Emirates and Bahrain to confront Iran. That alliance is compromised, however, by recent moves from Egypt's Gulf partners to mend fences with Iran as a result of their feeling exposed by Washington's alarming pivot toward Tehran at the expense of its traditional Sunni clients. Meanwhile, though overall Israel-Egypt trade remains minimal (as it had through the decades of cold peace under Mubarak and afterward), energy-strapped Egypt may soon be importing natural gas from Israel's newly-developed Tamar Reservoir in the Mediterranean. Given that Israel used to import natural gas from Egypt via a pipeline shared with Jordan (repeatedly sabotaged physically as well as assailed legally in Egypt since the fall of Mubarak), that is a remarkable turnaround indeed. Gordon: What triggered Qatar's re-opening of relations with Egypt despite the former's support of Hamas and the Brotherhood? Stock: The main factor was probably al-Sisi's logical desire to stay in step with the policy of Egypt's current primary foreign donors and investors, the Arab states in the Persian Gulf. After freezing relations with Qatar due to its support for Hamas and the MB, and perhaps also AQ and IS (the latter only early on? ), and the universal irritant of Doha-based Al Jazeera, the members of the Gulf Cooperation Council (GCC), especially Saudi Arabia and the United Arab Emirates, decided last summer to repair the rift, apparently in face of the increasing U.S. tilt toward Iran. The U.S. tried to bypass al-Sisi by turning to Qatar and Turkey—both of whom Cairo had shunned for their support of Islamists and their criticism of Morsi's ouster—as intermediaries with Hamas in the Gaza conflict last summer. Ironically, that move may have done more to damage relations with Washington than with either Doha or Ankara, who probably could not be totally excluded in any case, given their closeness to Hamas. Yet those two regional rival countries' desire to cut out Cairo, the historic mediator between the Palestinians, Israel and the West, did aggravate the Egyptians enormously, to be sure. Qatar has taken some token steps to distance itself from the MB, like deporting several MB leaders who had taken refuge there. But Qatar apparently continues to finance them in their new home in London, and few believe the change is more than cosmetic. Thus the warming with Egypt and even within the GCC may not long endure. Gordon: Why has the US Administration maintained an arm's length relationship with al-Sisi subsequent to the ouster of Morsi? "Obama's leftist, rather Edward-Saidian worldview ... sees indigenous anti-Western forces such as the Islamists to be the benignly natural and legitimate consequence of American and European policies during the colonial era and the Cold War." Stock: It is no doubt due to Obama's leftist, rather Edward-Saidian worldview, which sees indigenous anti-Western forces such as the Islamists to be the benignly natural and legitimate consequence of American and European policies during the colonial era and the Cold War—for which he has apologized repeatedly. He also has a positive, nostalgic view of Islam, given that he was born of a Muslim father and having apparently been raised as one by his step-father during his early childhood in Indonesia, and seems to project this image onto radical groups like the MB who cleverly pose as moderates. He is thus surrounded by numerous pro-Islamist advisers, as well as those who simply take a naïve view of groups like the MB, Hamas and Hizbollah--and even the Taliban (not a new position, but one now getting attention in the news). It also means that he denies the common Islamist ideology of all those groups as well as AQ and IS, or even any connection of their beliefs to Islam. This, despite their being made up entirely of Muslims, that they base their ideology and tactics on the Qur'an, Hadith and other key Islamic texts, and that they have a very wide appeal in the global Islamic community. This is even more bizarre if you compare his statements and those of his aides about this question to those of al-Sisi—a Muslim leader of a majority Muslim country—at the seat of Sunni Islam's highest authority, al-Azhar, on New Year's Day. One of them, Obama, is willfully blind; the other, al-Sisi, with devastating clarity, identifies the problem as coming from within the very heart of Islam. On a personal level, Obama does not take kindly to those who cross him. Just look at his relationship with Congress, and with Benjamin Netanyahu, while ignoring his own transgressions against those he thinks are transgressing against him. He regarded al-Sisi's patriotic overthrow of Morsi--whom he had bolstered with more and more aid even as the MB leader became more and dictatorial--at the demand of more than twice as many Egyptians as those who voted for Morsi, as a personal affront as well as ideological heresy. 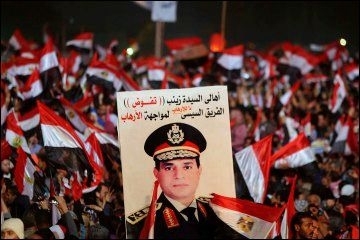 He has since punished al-Sisi and the Egyptian people who rejected his chosen savior of their destiny accordingly. That may have softened a bit recently, due to the need to find Arab allies to fight IS, but that is not a serious effort: the default position is against al-Sisi and for the MB. Gordon: Given your Egyptian sojourn does al-Sisi have both the domestic and international support to implement his agenda? Stock: Domestic, yes—all but a quarter to a third of the country wants him to succeed. But internationally is another story. Al-Sisi's greatest enemy is not the MB, or even IS, but the president of the United States. When the State Department invited key figures from the pro-MB alliance of groups to a major conference in Washington this week, he was signaling his desire (and only Obama sets our foreign policy) to overthrow al-Sisi—just as his invitation to the leaders from the banned MB to sit in the front row of his Cairo speech in 2009 signaled that he wanted to remove Mubarak. So U.S.-dependent international institutions and allies may not be too supportive of al-Sisi. The only possible silver lining for Egypt is, ironically (given our historic alliance), really a great problem for our country, if one values its role of global leadership since World War II. That is, Obama has done so much to destroy America's standing with the rest of the world that even our closest allies no longer fear to stray, and may yet not follow his wishes regarding al-Sisi. Tragically, on many issues, that may be better for us all until Obama leaves office. For the heading he has set leads directly to hell, a destination that many countries, thanks to in large part to his policies, have already seen (and Syria and Libya have already become)--good intentions (by his lights) notwithstanding. 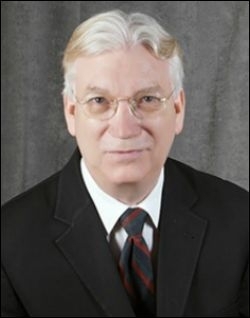 Gordon: Dr. Stock many thanks for this highly informative interview.